If you are using Swift 4G Network, get in here real quick like ASA, because SWIFT is dashing out 200% free bonus on data usage. You won’t understand what it means to download 5GB file in 30 seconds if you are not using Swift 4G Network. Jokes apart Swift 4G Network is real definition speed, u get full internet speed while on Swift 4G. Well Swift 4G LTE is calling on all its Subscribers to come and enjoy free 200% data bonus, yessss you heard me, in case you didnt, I meant Swift 4G LTE is currently giving free xtra data package to its subscribers on business plan which is currently tempting for everyone using that network data. 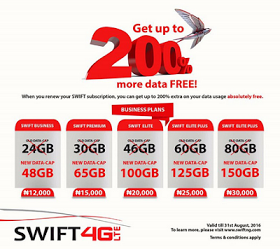 What are the offer available on the Swift 4G 200% data bonus?? All you need to do is to renew your subscription and you’ll get 200% extra data free of charge. Offer Valid till 31st of August 2016. Don’t Miss Out Business owners.